This was a good weekend, but there wasn't a whole lot of knitting. 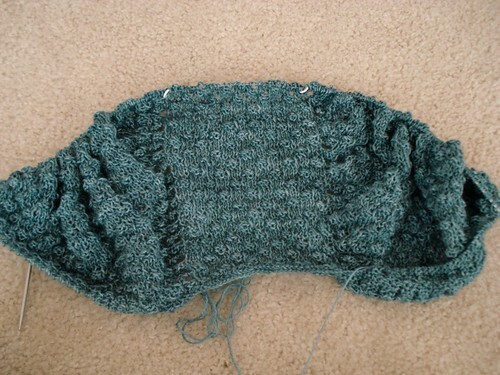 I did get my Calliope's Odyssey to the point where I'm ready to begin the Mosaic Knitting. I appreciate the tip last week, and I will be going up a needle size for this section (the pattern does mention it, but it mentions it in the written out directions part of the pattern and I'm knitting from the charts). What I did get done was a bunch of organizing and clearing out. Specifically, my workspace here in the kitchen. Our kitchen was designed with a large work and planning area built in. I love it and it's great for paying bills, organizing the family, and storing my cookbooks. On the other hand, it easily becomes a landing pad for general clutter. I also had some things there that I really don't need often enough to justify keeping them out on the workspace. Now the clutter is gone and the only things that are out, I use regularly. It felt good to get it under control and now I've got so much more space to work and design and plan! Also this weekend, Max fell into the bathtub. It was full. He wasn't amused. I wrapped him in a towel and cuddled him until he warmed up and dried off, but he did not enjoy his first swimming lesson. Mickael and Logan thought it was funny. Finally, this morning on my run I saw a bluebird! First one I've seen this Spring and he was sitting high in a tree, checking things out, doing bluebird business. I love them and seeing one this morning was a nice surprise. We have a bluebird nest box, and the male has been checking it out. I haven't seen a female with him yet. H signs the lease, but she builds the nest!